Seawalls are widely used along Florida’s coastlines. They create a border between land and sea. They protect our shorelines, properties, buildings and roadways from disappearing with the tide. Seawalls serve as protection from storm surges, coastal flooding and erosion. They vary in type and materials, but they typically are very expensive to build. Though seawalls are designed to protect us, over time they become damaged from the forces of Mother Nature. Water makes its way past the seawall when the tide comes in and carries a small amount of soil back out with the tide each time. 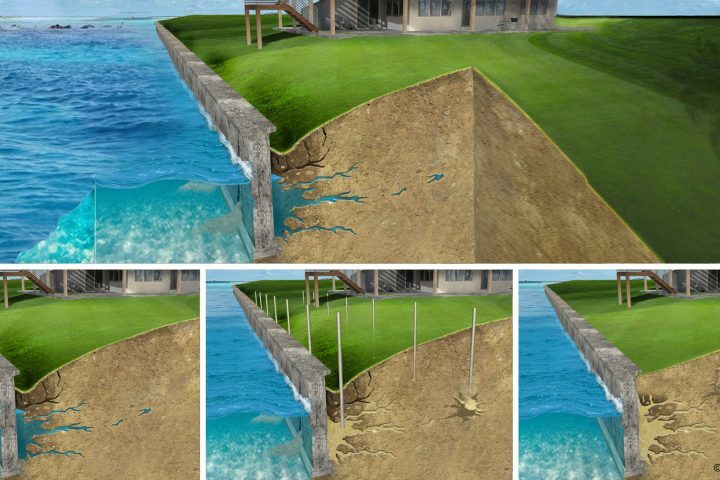 Over time this erosion can lead to settling and large voids or sink holes under your deck or behind your seawall. Untreated, this can lead to costly replacement or damages to inland property. We can restore your existing seawalls stability by injecting high density expanding polyurethane foam to seal cracks, fill voids, and stabilize the soils that keep your seawall standing. NSF approval is a must. EFS proudly uses Alchemy Polymers, which is one of only two companies in the world with NSF approved lifting foam that is designed to work underwater. This single designation ensures compliance with the Safe Water Drinking Act and ensures peace of mind for you, your family, and the environment. Call EFS today for your free estimate.